Magnificent Grange Court is a beautiful, contemporary home, finished to a superb standard throughout. Full height windows in the excellent open plan living area fill the room with light. Relax in reclining sofas and enjoy the view over the patio to the fields beyond. In the entrance hall, two reclining massage chairs are perfect for unwinding after exhilarating walks along the coast path. A playroom makes a great space for noisy games. Downstairs are four bedrooms; three of which look on to the patio, two have en-suite bathrooms and two share a family bathroom with walk-in shower. The luxurious master bedroom comprises a massage bed, slipper bath and shower with massage jets. 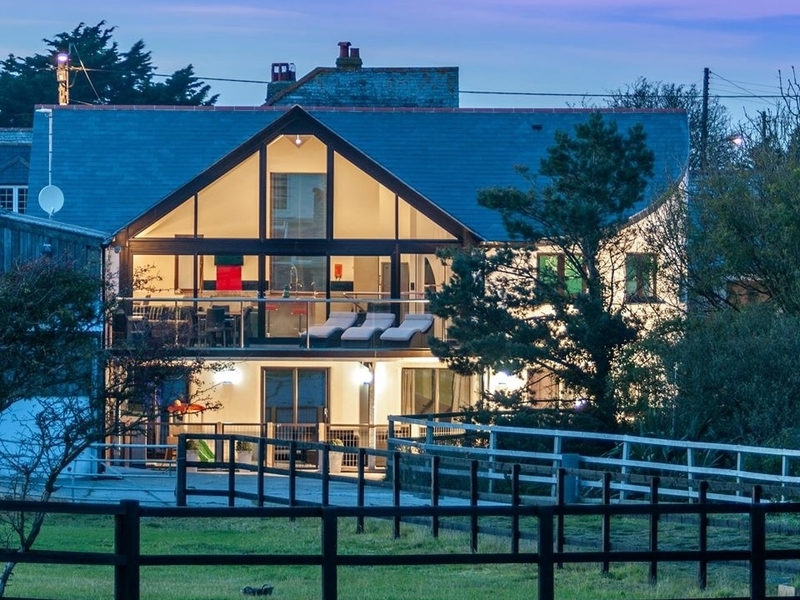 A large balcony, accessible from the living area extends over the patio and has sun loungers and table and chairs.In the rustic games barn (not heated) there is a pool table, table tennis and trampoline. There is also a children's play area with swings, slide, sand pit, trampoline and tractor fort approximately 100 yards from the property. The small hamlet of Bossiney is situated on the stunning north Cornish coast and is within a short walk of the historic village of Tintagel with its Arthurian castle and clifftop coast path. Underfloor heating. Electric oven and induction hob, fridge, freezer, dishwasher, microwave, washing machine, tumble dryer. TV/DVD, WiFi. Bed linen and towels included free of charge. Cot and highchair available on request. Off road parking for 3 cars. Large patio area with furniture. Separate lawned play area. Up to 4 pets accepted. No smoking. Shop 1/2 mile. Pub 1/2 mile. Beach 1/2 mile.